Most of these projects refer to the School of Computing, and to the School of Engineering. BTH has developed strong collaboration with the Indian Institute of Technology Madras (IIT-M) in Chennai, including a 2008 Memorandum of Understanding concerning R&D collaboration and student exchange between the two institutes of technology. During the period 2007-09, Professor Sara Eriksén coordinated a multidisciplinary research project on e-governance, entitled ”Participatory, sustainable, convergent and high quality public e-services – developing methods and practices”, that was given a Swedish Research Links grant in 2006. The project aimed at developing long-term research cooperation within the area of e-government with the Telecommunications and Computer Networking (TeNeT) group within the Dept. of Electrical Engineering at IIT-M. On the Indian side, the project has been coordinated by Prof. Ashok Jhunjhunwala, research leader of the TeNeT group within within the Dept. of Electrical Engineering at the Indian Institute of Technology Madras (IIT-M) in Chennai, Tamil Nadu. On the Swedish side, the project is coordinated by Prof. Sara Eriksén, group leader for the Informatics and Work (IAW) research group within the School of Computing. This group had an explicit mission: to provide people living in rural areas in India with robust, affordable and easily accessible internet access and e-services which can contribute to good quality of life for individuals and sustainable development and growth for India and the rest of the world. At BTH, Associate Professor Markus Fiedler, Dr. Annelie Ekelin and Charlott Lorentzen were also members of the project group. Read the final project report, dated February 2011. More information about the research collaboration with IITM. 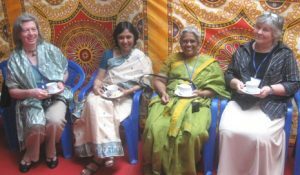 Participants at the Chennai workshop during a tea break: Yvonne Dittrich, Aarti Kawlra, Hema Murthy and Sara Eriksén. On 18–20 February 2010, a joint workshop was held on ”Participatory Design of ICT: Opportunities and Challenges”, in Chennai. The workshop aimed to bring together industry, academia, designers and engineers in the field of ICT’s to discuss the role and methods of Participatory Design (PD) for methodology for participatory design of ICT, and identify opportunities and challenges to PD. The workshop brought together industry, engineers, social scientists and project managers in the field of ICT:s for a discussion on the role and methods of Participatory Design (PD). The participants were scholars from BTH and Lund University in Sweden, ITU Copenhagen in Denmark, TeNeT Group, Faculty of CSE, EE, IIT Madras, and project managers from RTBI. From the Industry – Ericsson India and Chennai were both represented and some RTBI and TeNeT companies like Uniphore and Invention Labs & Vortex Eng were also represented. All presentations and a summarizing report from the workshop are available on the Internet. In September 2009, Prof. Sara Eriksén received a SASNET Guest Lecture Programme grant, for the invitation to Sweden of Dr. Aarti Kawlra from IIT-M. He also works as Principal Project Officer for the Indo-UK Consortium on Advanced Communication Technology. 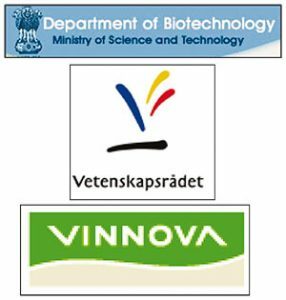 In December 2013, the School of Computing at BTH was selected for funding from the Strategic Indo-Swedish Cooperative Innovation Programme, jointly administered by The Department of Biotechnology, Government of India (DBT); the Swedish Governmental Agency for Innovation Systems (VINNOVA); and the Swedish Research Council (SRC). The project, to be carried out in collaboration with the Indian Institute of Technology Madras (IIT-M), Chennai, is entitled ”Transforming Healthcare Delivery – Innovative mHealth Technologies for Health Promotion and Better Health Outcome”, and it receives SEK 5 m. for the period 2014 – 2016. The project leaders are Professor Sara Eriksén, BTH; and Professor Ashok Jhunjhunwala, TeNeT Group at IIT-M, Chennai. More information about the project. A Call for the programme was announced in the spring 2013, and decisions were taken in December 2013. Altogether five Indo-Swedish projects in the field of Health and Disease prevention were selected to receive funding. Full information about the selection. The goal of the programme is to support long-term Indo-Swedish research and innovation collaboration in the field of Health. Indian and Swedish industry and researchers in both private and public sectors were invited to submit joint project applications for collaborative research and innovation projects. The approach is to establish and strengthen collaborative industry and research networks between India and Sweden by funding joint research and innovation projects, exchange visits, demonstration and proof of principle. Since 2007 a lot of things have happened. The number of freemoving non-European students has dramatically fallen with the introduction of tuition fees at Swedish universities, including BTH. On the other hand, formal educational collaboration programmes with universities in south India have been further developed, not the least because of work done by Mr. Gurudutt Velpula, an ex-student from Hyderabad, since 2009 working as Project Director – Indian Operations at BTH. He received an Honorary PhD at BTH for his efforts in 2008.